We were a little confused when we arrived, as we had no idea this was a person's home that thy rent out the rooms each night. Very nice place to stay and the owner was very sweet and hospitable. 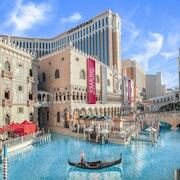 Why Stay at B&B in Las Vegas? Whether you're on a family vacation and want a small, cozy place to stay, or you're traveling solo and hoping to get some local recommendations, B&Bs can be a great choice. You'll find 913 lodging options and 2 B&Bs in Las Vegas, so you can find something that works for you. If your goal is to get away from the noise and crowds in Las Vegas, choosing a B&B that's tucked away from the city center can be a great way to stay someplace where you can really relax. Hoping to play some golf on your trip? You might stop by Las Vegas Country Club or Bali Hai Golf Club while you're in Las Vegas. Travelers who want to experience Las Vegas should check out its top-notch casinos and great live music scene. If getting out in nature is your priority, Ethel M Botanical Cactus Gardens and Red Rock Canyon are worth a visit. You might also consider a trip to top attractions like Hoover Dam or Fashion Show Mall if you've got time to see more of the larger area. Fly into Las Vegas, NV (LAS-McCarran Intl. ), which is located 2.4 mi (3.8 km) away from the city center. You can also search for flights into Las Vegas, NV (VGT-North Las Vegas), which is 6.7 mi (10.8 km) away. If you'd like to explore around the area, you may want a rental car for your journey.